Wow, that's a mouthful of a recipe title!! So our summer has been fabulously cool. I know there are some haters out there, but I have adored this summer. I don't know how many nights we sat out on the patio and I needed a light hoodie or long pants. That is MY kind of weather and I'd gladly take it for 6 months a year. But then September approached and all of the heat and humidity came back. I don't even want to be outside (thank goodness the husband does 99% of the grilling!!). 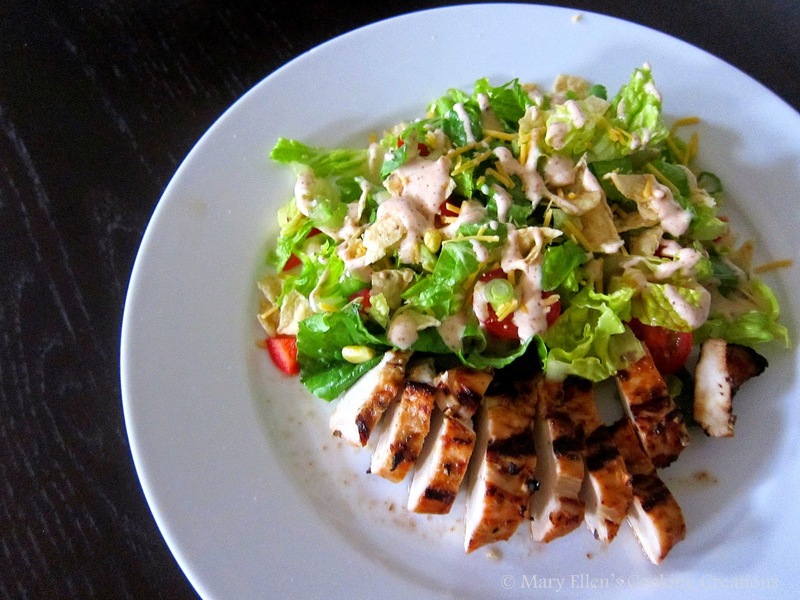 This weather is perfect for "it's too hot to cook" meals, like this grilled chicken and salad. The night before I made this dinner I trimmed the chicken, put it in a casserole dish and started to hunt for marinade ingredients. I didn't have any idea for sides yet, but decided to give my marinade some tex-mex flavors and spices. And then something made me grab the BBQ sauce and I decided to experiment. Guess what? It worked! Just like using hoisin in an Asian inspired marinade, the BBQ sauce added some sticky sweetness and held it all together. 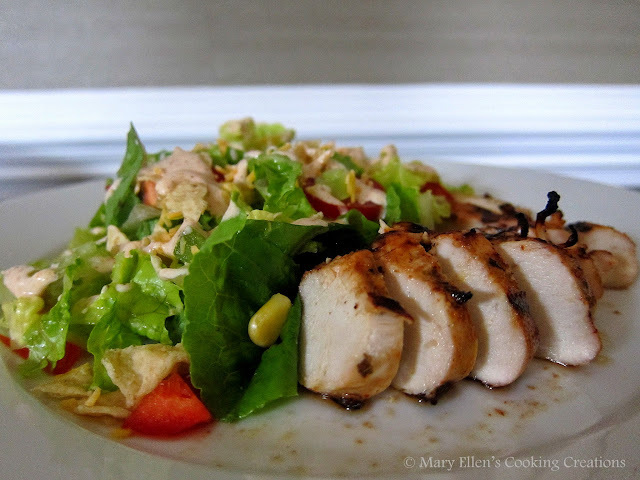 The salad and dressing were last minute creations as Jon was heating the grill and cooking the chicken. Sometimes meals like this are the best - spontaneous, creative, simple, easy, and most importantly, delicious. 1/2 c corn - I used frozen (thawed and brought to room temp), but if I had more time grilled corn would have been great! Mix the marinade ingredients (except the lime juice) and pour over chicken in a shallow dish. Cover and marinate at least 8 hours. Add the lime juice about 30 minutes before you plan on grilling the chicken. Mix all of the salad ingredients (except the chips and cheese) and chill at least 30 minutes. Mix the dressing ingredients and chill. Serve the salad topped with some of the chips, cheese and green onions followed by the dressing and alongside the sliced chicken.